I get a little thrill every time I work with the Frostwood Lodge designer series papers. This project pairs one of the wood looks from Frostwood Lodge Designer Series Papers with the Gently Falling two-step stamp set. I stamped the leaves in Soft Suede using the leaf outline from the 2-step stamp set. Then I stamped with More Mustard as the second step of the Gently Falling stamp set. Then I used a sponge dauber and ink from the Cajun Craze ink pad around the edges of each leaf. I tried edging the leaf two different ways. First I sponged the edges before cutting out the leaf. Then I tried it where I cut out the leaf and then held the leaf in my hand to sponge the edges. Both worked equally well and gave about the same results. Then, after cutting out each leaf, I used my bone folders and slightly curled the edges of the leaf to give them even more dimension. It made the leaves look much more life-like, in my opinion. I added one of the Spice Cake designer Buttons in the fun jumbo size. There were so many sentiments that would look good on this card. "Grateful" form Always Thankful, or "Give Thanks" from Hand-Penned Holidays. 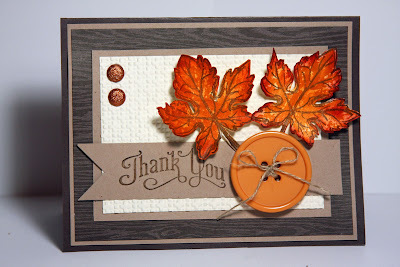 I used Thank You from the Perfectly Penned sentiment set. Visit my Online Store to buy the supplies to make this project. 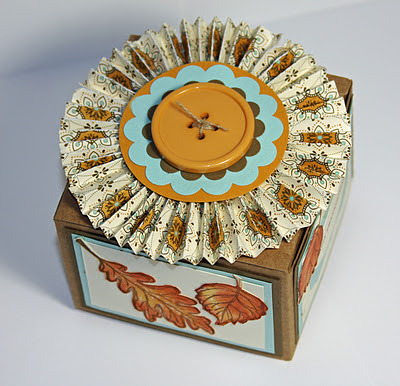 Additionally, This fun gift box uses the Kraft Gift Boxes from the Holiday Mini Catalog. 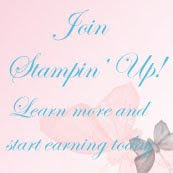 Perfect for gift cards, or a few of the cookies made with the new Stampin' Up! 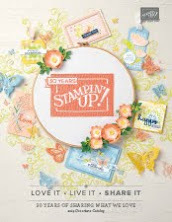 Sweet Pressed Cookie Stamps. Decorate them in a seasonal theme, like mine, and you'll have the perfect hostess gift for your Thanksgiving Dinner hostess. I used the Simply Scored Scoring Tool from the Holiday Mini Catalog and pleated my topper at 1/4". 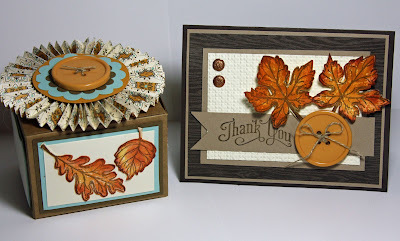 I grabbed 5 punches--including my largest circle punches and scalloped circle punches--and quickly formed the center base to showcase the Jumbo Spice Cake Designer Button. On the sides of the box I layered Soft Suede, Pool Party and and Very Vanilla. 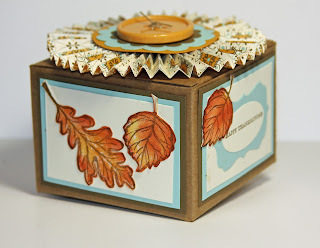 I used more leaves from the Gently Falling stamp set and added a label and sentiment to the front of the boxes. These boxes are less that $1 each and come in a four-pack. What a great gift set for Thanksgiving. Arrive for Thanksgiving with a hostess gift in the decorated craft box. And send the Thank-you card following the meal. If you're from the Houston, TX area, attend my class this Sunday, Oct 9, to make these and other wonderful fall projects and get a head start on the Holidays. 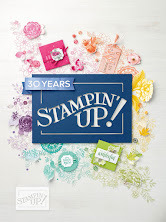 Reminder: Check the Stampin' Up! Clearance Rack: A number of Holiday items were added Oct 1 at up to 60% off. But hurry! 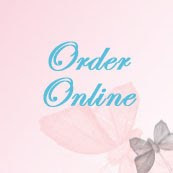 We've seen popular punches and other items disappear quickly. 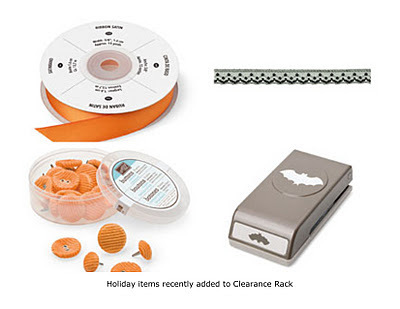 Look for bargins on Pumpkin Pie 5/8" Satin Ribbon (119749), Pumpkin Pie Corduroy Buttons (114342), 1/2" Raven Lace Trim (120988), and the Batty Bat Punch (119279) for Halloween cards and scrapbook pages.